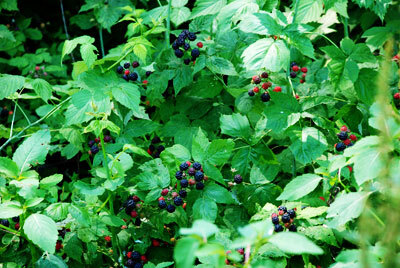 Go out early, while everyone is still sleeping, and pick some fresh black raspberries. Whip up some pancake batter. Do this in the style of Katherine Hepburn in Woman of the Year, with lots of noise, that somehow doesn’t seem to wake anyone. Then, make this fresh black raspberry syrup. Add one-to two tablespoons of sugar for every cup of berries. More, depending on your tastes. Add a dash of cornstarch as a thickener. Turn the flame to a low heat, and using the back of a wooden spoon, smash the berries into the pan. As soon as the mixture starts to bubble, turn off the heat. Let simmer while you cook the pancakes. 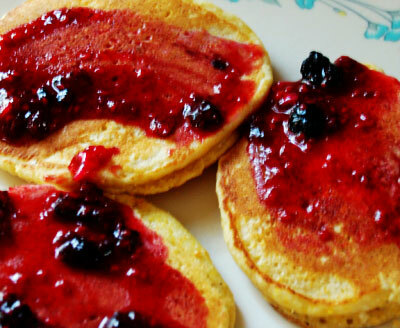 Spoon a dollop of black raspberry syrup on each pancake. Wow. That sounds like too much work for me in the morning! Oh my gosh! I would too!